Private citizens can box the Shetland Islands all they want, and of course the law doesn’t apply outside Scotland. 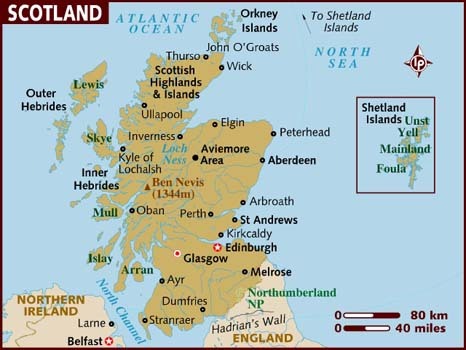 But as of October 4, 2018, it is illegal for any public authority in Scotland to publish a map on which the Shetland Islands appear anywhere other than their correct geographical location in relation to the rest of Scotland. Hence, the Shetlands generally are rudely uprooted from their natural habitat, crammed into a box, and depicted somewhere they are not. This, apparently, could no longer be tolerated. “My contention is the islands should be in the right place on the map,” Shetland MP Tavish Scott said in March. And that isn’t the Moray Firth, the big dent northeast of Inverness where the islands often are put. “If [the Shetlands were] closer to the Moray Firth,” Scott was quoted as saying, “or indeed in the Moray Firth, I wouldn’t need to spend 12 hours going home on the boat from Aberdeen overnight.” (In fact it takes 12 ½.) But rather than take the practical approach of moving the islands closer, Scott’s proposal would make the maps bigger. The point, he said, “is simply to ensure that in future that government publications and documents do reflect the reality of Scotland in terms of its geography, and not something that fits neatly on an A4 sheet of paper.” This is important, he insisted, because of the misconception that the islands are nearer to the mainland than they actually are. They are further away, and not surrounded by an actual box, you see. (1) There is to be a Shetland mapping requirement. (b) where Ministers or, as the case may be, the authority consider that there are reasons not to comply, provide in such manner as they consider appropriate, information about those reasons. (3) The Shetland mapping requirement is that, in any map of Scotland, the Shetland Islands must be displayed in a manner that accurately and proportionately represents their geographical location in relation to the rest of Scotland. So this is not actually the flat prohibition it first appeared to be. If the listed authorities wish to publish a map of Scotland, they must either (1) make that map sufficiently ginormous to include the Shetlands without the need for a box, or (2) explain why they don’t want to. There don’t appear to be any penalties for failing to do these things, nor are there any standards for how the explanation is to be provided—it can be “in such manner as they consider appropriate,” which could be anything from a speech in Parliament to a rude little message written on the next map they publish. The Act generally requires the government to do more to consult with island communities before making changes that affect them significantly, though, so it’s probably understood that this would entail some sort of notice-and-comment procedure. The measure appears to have passed despite opposition from conservatives, or at least one Conservative Party member, who said “map specialists” (also known as “cartographers”) had told him that upsizing a map for this reason would necessarily reduce the scale by about 40 percent. Losing that detail only to gain “a whole chunk of sea” would be counterproductive, he said. Possibly the most helpful aspect of the Islands (Scotland) Act 2018, however, is its definition of “island.” An “island,” it turns out, is “a naturally formed area of land which is (a) surrounded on all sides by the sea (ignoring artificial structures such as bridges), and (b) above water at high tide.” I’m told there was a dispute over whether Skye is an “island” given that it’s connected to the mainland by a bridge. Bridges are okay, but if you were planning on creating your own island in order to get special treatment, forget it.